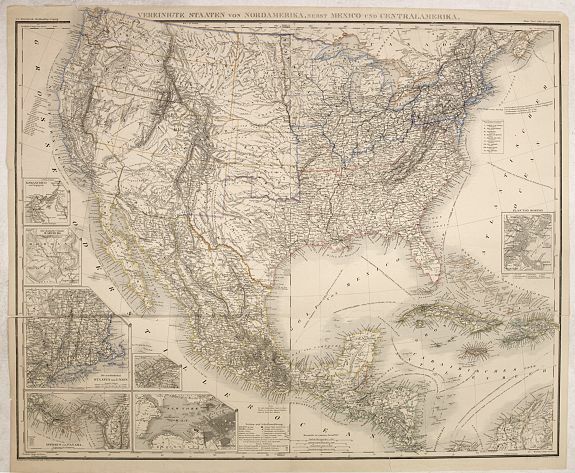 Old map by STEIN - Vereinigte Staaten von Nord Amerika, nebst Mexico.. Title: Vereinigte Staaten von Nord Amerika, nebst Mexico.. Size: 25.4 x 31.4 inches. Condition: Repair of split of 2 horizontal folds, 5cm. into engraved area. Hardly notable. Good and dark impression. Uncommon map United States, with inset maps of San Francisco, German settlement Wartburg near Kingston, New England, Panama, New York, and Boston, including the Great Lakes area. With colour-key and shipping routes. Engraved by R.Schmidt, H.Eberhardt and J.L.von Baehr. Prepared by G.Heck in 1855 and revised in 1863. From: Stein. Neuer Atlas der gantzen Erde.